XS4 Locker Lock is an electronic locker lock solution designed to provide a high level of security protection for a wide variety of cabinets and lockers. 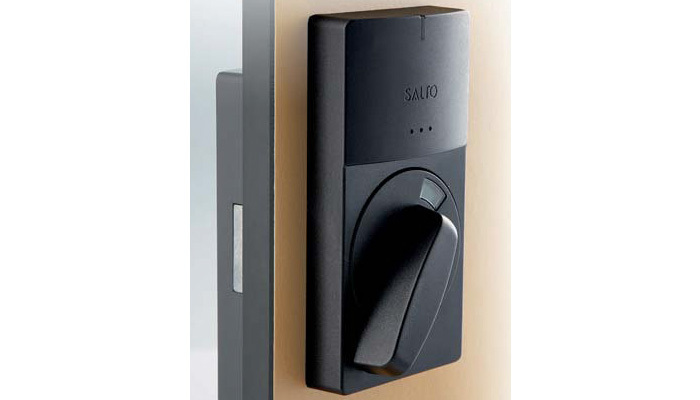 It can be fully integrated with the SALTO access control solution or be operated as a stand-alone system. ID technologies available: contactless RFID identification, DESFire, DESFire EV1, Mifare, Mifare plus and Mifare Ultralight C compatible. Outer thumbturn with red green indicator for availability of the locker, electronically managed release. Lock with large security deadbolt is built into the Locker. Ideal for retro fit applications as outside escutcheon rotates for different door handing and styles. No handing. Battery pack: sabotage protected on the inside together with decision making electronics. Can only be opened by using special tool. Simple offline installation is possible on many types of small and thin doors. Door thickness: adaptable on site. Cover color: RAL 7016 Anthracite. Door thickness: adaptable upon request.